06. 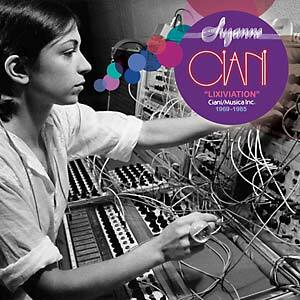 SUZANNE CIANI - Sound of a Dream Kissing (from "Voices of Packaged Souls"
Restocked; 2012 release. With a sonic portfolio that boasts commissions for the Xenon classic pinball machine, the sounds for the Meco Star Wars theme, the Atari TV commercials and the electronic sound effects in the original Stepford Wives film (amongst many others) the mutant electronic music CV of Suzanne Ciani is proof that in a 1970s commercial world of boys toys, monopolized by a male-dominated media industry, a woman's touch was the essential secret ingredient to successful sonic seduction. 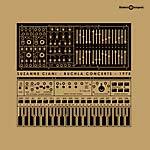 A classically-trained musician with an MA in music composition, this American Italian pianist was first introduced to the synthesizer via her connections in the art world when abstract sculptor and collaborator Harold Paris introduced Suzanne to synthesizer designer Don Buchla who created the instrument that would come to define Ciani's synthetic sound (The Buchla Synthesizer). 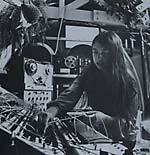 Cutting her teeth providing self-initiated electronic music projects for art galleries, experimental film directors, pop record producers and proto-video nasties, Suzanne soon located to New York where she quickly became the first point-of-call for electronic music services in both the underground experimental fields and the commercial advertising worlds alike. 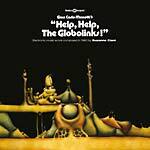 Counting names like Vangelis and Harald Bode amongst her close friends, Suzanne and her Ciani Musica company became the testing-ground for virtually any type of new developments in electronic and computerized music, amassing an expansive vault of commercially-unexposed electronic experiments which have remained untouched for over 30 years... until now.